Completely free. No obligation. Why wait another day? Find out if you have a hearing loss or tinnitus − and if so, how severe it is and which treatment options are available. PLEASE NOTE: Offer not applicable to patients under 18 years of age or existing patients. Superior Service and Excellent Staff! "We were referred by a private doctor and could not be more satisfied! Absolutely everyone we have dealt with are magnificent! Dr. Ana is very sensitive and explains everything thoroughly and answers all questions with out hesitation'! Would recommend to ABSOLUTELY everyone who doesn't like being left in the wind when wondering about questions and concerns!!!" 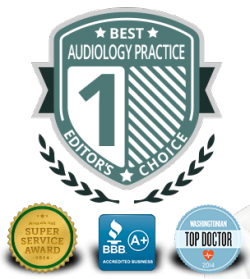 I Recommend Ascent Audiology Highly! "I have had growing high frequency hearing loss for about 15 years, with complaints at times from family members increasingly. But I did not want to look old by wearing a hearing aid. Finally after a recent argument with my wife over a miscommunication, I went to Ascent Audiology in McLean, VA, the very next day. They tested my hearing thoroughly and explained the test results well. They showed me the various hearing aid options and explained their pro's and con's. They let me try the hearing aids to see how well they worked and how visible they were. Most importantly to me, I walked out of the office wearing a set of hearing aids that immediately improved my relationships in my family and radically improved my communication with coworkers and customers. I previously sensed I was kind of checking out of a lot of conversations at home and work that I simply could not strain hard enough to pick up on. I can now hear much better in all my conversation settings, and feel much more energized and engaged overall at work in particular due to the change."